First Day Hike at Westmoreland State Park 1650 State Park Road, Montross VA 22520. Choose from guided hikes led by rangers, or Master Naturalists or choose your own trail with a hike length. There's even a photography contest for hike participants through social media sites. 9pm - 12am Karaoke at The Riverboat. Every Friday. Be the next star of the show! Come on out and bring your friends to cheer you on. 10am - 7pm 12th Day of Christmas, 1732 Pope's Creek Rd., Colonial Beach VA 22443. At George Washington's Birthplace. Twelve Drummers Drumming: The Twelfth Day of Christmas. The Washington family celebrated the 12 days of Christmas which begins on Christmas Day and ends on January 5th. George and Martha Washington were married on Epiphany, January 6, 1759. The Memorial House will be decorated for the holidays and filled with colonial music. The plantation will be busy with demonstrations and activities performed by costumed interpreters. Visitors will have an opportunity to play a variety of African drums. The park will be illuminated at dusk with candles. 12pm - 3pm Free Community Lunch, St. Mary's Episcopal Church - the 1st Saturday of the month from noon to 3 p.m. It's homemade soup, hot bread, sweets,and beverage - no cost, just come, eat, enjoy. 4:30pm - 7:30pm Redskins play Seahawks. Watch the game on the bigscreens at Dockside. 6:30pm - 9:30pm Bingo at the Elks Lodge, 719 Ferry Landing, Colonial Beach VA 22443. Elks Lodge #2666. Snacks available for purchase. 9am - 1pm Winter Birding at Stratford Hall, 483 Great House Road, Stratford, VA 22558. Winter Birding: Mixed Species Flocking at Stratford Hall. Explore the benefits of mixed-species bird flocking for winter with a presentation by Dr. Andrew Dolby. From 9 am to 1pm in the duPont Library. $10 fee. 6pm - 7pm Artists Guild Meeting, 10 Garfield Ave., Colonial Beach VA 22443. Monthly meeting of the Colonial Beach Artist Guild. 9:30am - 5pm Robert E. Lee's Birthday Celebration 483 Great House Rd., Stratford VA 22558. At Stratford Hall. Free to the public from 9:30 am to 5 pm. Featured attractions include The Civil War 150 HistoryMobile and a book signing at 4 pm by Dr. James Robertson. Free house tours, refreshments, music by Evergreen Shade, and Robert E. Lee re-enactor Richard Crozier. 1pm - 4pm Martin Luther King Day of Service. 145 Cliff Road, Montross VA 22520 At Westmoreland State Park. Doctor Martin Luther King lived his life inthe service of others. Honor his memory by becoming a volunteer at Westmoreland State Park. Meet at the Discovery Center for an inspirational discussion of his contributions. Then head to the trails and beach to pickup trash and clean the park. Be sure to bring your water bottle, gloves and close- toed shoes. 5pm - 7pm Vino & Vittles at Tides Inn Market. Washington Ave., Colonial Beach VA 22443. At the Tides Inn Market. Enjoy tasty wine with their flatbread pizzas or try some delicious seafood bisque with a baguette. They also have stuffed peppers and lots of vegetarian options! 10am - 1pm Brunch at Dockside 1787 Castlewood Dr., Colonial Beach VA 22443. Come to Dockside for Brunch Benedict style (crab cake, fried oysters,sausage n' tomato or Canadian bacon) homemade corn beef hash, steak and eggs and more to choose from! Saturdays & Sundays. 12pm - 3pm Free Community Lunch St. Mary's Episcopal Church Free Community Lunch - the 1st Saturday of the month from noon to 3 p.m. It's homemade soup, hot bread, sweets, and beverage - no cost, just come, eat, enjoy. 5pm - 7pm Vino & Vittles at Tides Inn Market. Washington Ave., Colonial Beach VA 22443 Enjoy tasty wine with their flatbread pizzas or try some delicious seafood bisque with a baguette. They also have stuffed peppers and lots of vegetarian options! Tue May 7, 2013 12pm - 4pm Cheer Camp. 100 First Street, Colonial Beach VA 22443. CBHS cheerleaders will be holding a half day cheer camp at Colonial Beach High School for grades K-8 from 12:00-4:00pm. Transportation will be provided to the elementary students. The cost is $25.00 per child and a snack will be provided. 5pm - 7pm Vino & Vittles at Tides Inn Market. Enjoy tasty wine with their flatbread pizzas or try some delicious seafood bisque with a baguette. They also have stuffed peppers and lots of vegetarian options! 9:30am - 2pm Senior Law Day,100 First St., Colonial Beach VA 22443 Senior Citizens, their adult children, and all those interested in the challenging issues posed by the aging process, are invited to attend Senior Law Day, a free, half-day community outreach program sponsored by the Northern Neck Bar Association on Saturday, May 11, from 9:30a.m. 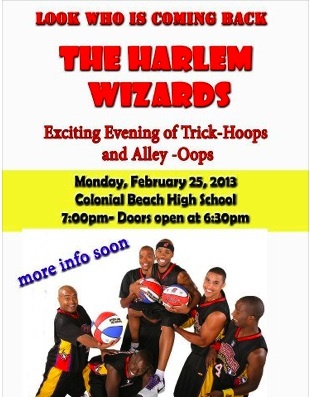 to 2 p.m. at Colonial Beach High School, 100 First Street, Colonial Beach. Topics will include better understanding Medicaid eligibility and how that may affect you; consideration of important estate planning issues and the need for advanced health-matters planning that all Seniors should be aware of; how to recognize and prevent fraud against Seniors; an introduction to the community services provided by TRIAD; an informative discussion on the function and range of services provided by Hospice; and a light-hearted look a tfuneral planning. The Presenters, who have received state-wide recognition for past events, include: Attorney R. Shawn Majette ofThompson McMullan Law Firm in Richmond; Attorney James Alfred Butts,IV, of Rumsey & Bugg in White Stone; Christopher Spare, Chief of Police, Warsaw (who will discuss the TRIAD partnership between law enforcement and seniors); Special Agent W. Chris Palicia of the Virginia State Police, Christel Lewis Earles, M.S.W., of Tappahannock Riverside Hospice; and Thomas Gale, Director of Curie Funeral Home, in Kilmarnock. In addition to an exceptional program, good fellowship, and a free, delicious, catered box lunch, all those attending will receive their own (free) copy of the information-filled Senior Citizen’s Guidebook, a valuable resource published by the Virginia State Bar, Senior Lawyer Conference. This is the fifth Senior Law Day program to be presented by the Northern Neck Bar Association since 2007; and is an opportunity that should not be missed. To pre-register, please contact Bay Aging at 1-800-493-0238, space is limited. 10am - 11am Paws for Reading. 20 Washington Ave., Colonial Beach VA 22443. Reading with therapy dogs trained to be avid listeners. The library provides books, or bring a favorite. Practice your reading and collect a bookmark, too. Grades K-6, Please call and sign up. 7pm - 11pm Sara Gray Band at High Tides' "Black Pearl" Tiki Bar on the Boardwalk. 6pm - 7pm Artists Guild Meeting. 10 Garfield Ave., Colonial Beach VA 22443. Monthly meeting of the ColonialBeach Artist Guild. 10am - 3pm Community Fair. 10 Garfield Ave., Colonial Beach VA 22443. Moon Bounce, Blood Pressure Checks, Puppet Show, Live Music, Portrait Sketches, Door Prizes, Face Painting, Free Clothes, Child Safety Seat Checks and so much more! 1pm - 5pm Ladies Only Wine Class. 5872 Leedstown Road, Colonial Beach VA 22443 At Ingleside Winery. This interactive, fun-filled class provides the perfect opportunity for you to increase your wine knowledge in a relaxed and informal setting. Learn unspoken wine etiquette, how to taste wine, detect flaws and understand why some wines don’t appeal to you. Sample some unusual pairings and gain the knowledge to be more confident in selecting your wine. Bring your girlfriends - and make new ones too! Reservations required; space is limited. Admission includes souvenir wine glass, tastings and treats. 9pm - 11:30pm Kaleidoscope Comedy at The Riverboat. 301 Beach Terrace, Colonial Beach VA 22443. Third Saturday of every month: comedy at the Riverboat from 9pm..Kaleidoscope comedy presents 3 comedians each month. Admission is free... great shows, terrific headliners. This is NOT open mike entertainment, it's the real deal. 6:30am - 3pm Soft Opening of Bobby K's. 4099 King's Hwy., Colonial Beach VA 22443. Bobby K's Roadside Cafe will be having a soft opening, serving breakfast and lunch. 10am - 5pm All Wheel Show. Commercial and Customs All Wheel Show on Town Hill. Craft fair, parade, public safety demonstrations, ladder golf, music and more! 10am - 4pm Spring on the Plantation. 1732 Pope's Creek Road, Colonial Beach VA 22443 To understand Washington, we must understand plantation life. 18th century activities and demonstrations such as sheep shearing, tobacco planting, blacksmithing and open hearth cooking will be offered at George Washington's Birthplace Popes Creek Plantation. 2pm - 7pm Pig Roast. 27 Colonial Ave., Colonial Beach VA 22443. Memorial Day Weekend Annual Pig Roast.....includes baked beans, coleslaw and rolls $ 8.00. Come out and support your veterans. Open to the public. 7pm - 10:30pm Kashmir at High Tides "Black Pearl" Tiki Bar on the Boardwalk. 10am - 4pm Spring on the Plantation 1732 Pope's Creek Road, Colonial Beach VA 22443.To understand Washington, we must understand plantation life.18th centuryactivities and demonstrations such as sheepshearing, tobacco planting, blacksmithing and open hearth cooking will be offered at George Washington's Birthplace Popes Creek Plantation. 11am - 12pm Memorial Day Service at The Cannon, corner of Irving and Boundary. 6:30pm - 9:30pm Bingo at the Elks Lodge, 719 Ferry Landing, Colonial Beach VA 22443 Elks Lodge #2666. Snacks available for purchase. 5:45pm - 6:45pm Zumba Class 215 Washington Ave., Colonial Beach VA 22443. Free Zumba class at the newly-opened River Gym.